I have a few magazine subscriptions that arrive in the mail each month and I often purchase magazines on trips to the grocery store. I love to read and keep up-to-date on what’s new and hot, but it can get expensive! I’ve discovered a way I can read my favourite magazines and save some money at the same time. Next Issue Canada has been called the Netflix of magazines and it’s really true. I’ve signed up for the free 30 day trial to see how I liked it, and am hooked! Not only am I saving money and have a ton of new reading material, but I also don’t have to deal with the magazine clutter. 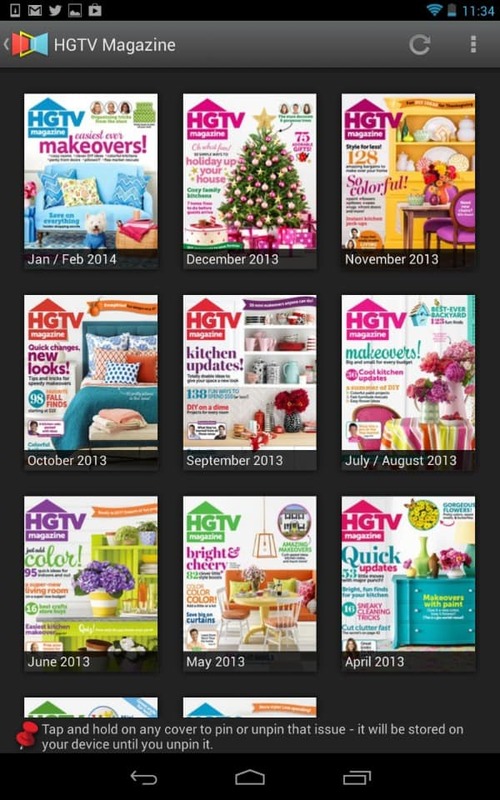 With Next Issue Canada you have unlimited access to over 100 popular magazines accessible on your mobile device. After you sign up for an account, download the Next Issue Canada app on either your iPad, iPhone, Android tablet or Windows 8 PC or tablet. 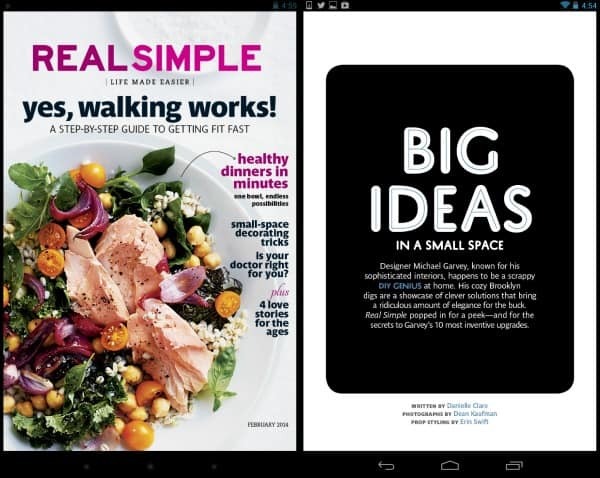 I have been using my Google Nexus 7 tablet to read the magazines. Some of my favourite ones include Better Homes and Gardens, Chatelaine, Eating Well, Today’s Parent and many more. You can browse through all the categories and available magazines on the Next Issue Canada site. 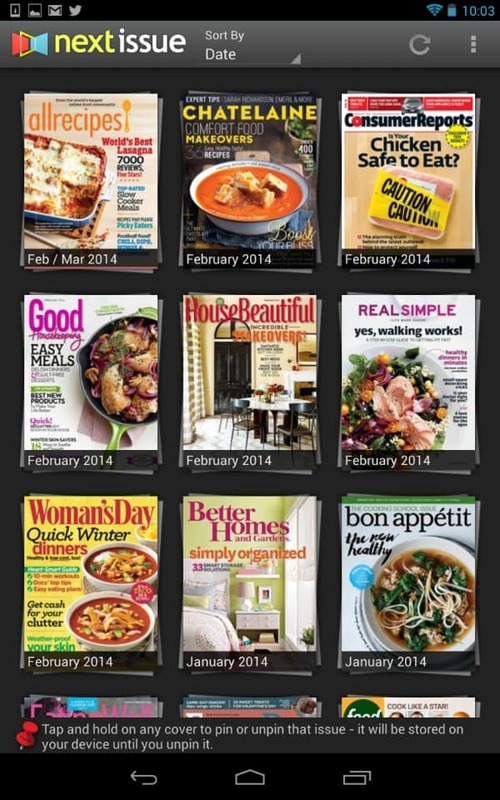 Creating a Personal Library: You can pick and choose the magazines you want to add to your personal library. When you open the app you can easily find the ones you want to read and new issues will automatically appear in the library. Easy to Navigate: Read the magazine from cover to cover with just a quick swipe of your finger or use the shortcut tool to jump to a specific section. Digital-Only Bonus Content: Access the extra features of the digital edition. Read online and offline: You can download your favourites to your device to enjoy for offline ready. This feature will come in handy on road trips or places that have no (or poor) Wi-fi connections. I’ve been doing a lot of reading lately and wanted to share five of my favourite magazine articles I discovered on the Next Issue app. Your Clutter Cured! 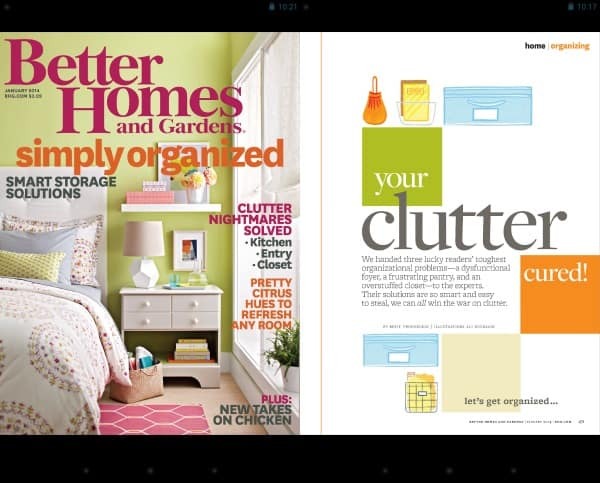 from Better Homes and Gardens January 2014: Organization experts help three readers solve their clutter challenges including a chaotic front entrance, pantry and closet. See what the mess looked like before and how the space was transformed into something functional and easy to replicate in your home too! Don’t Get Scammed! 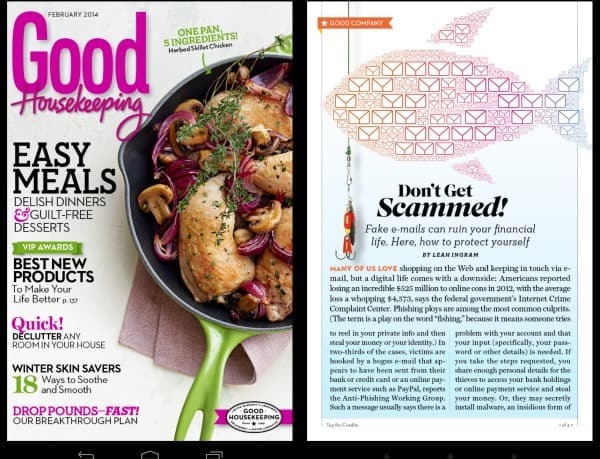 from Good Housekeeping: Tips February 2014: on how to spot a fraudulent email, Facebook message and tweet where a scammer wants to steal your financial information, gain access to your accounts or infect your computer with a virus. You’ll also learn how to protect yourself and what to do if you inadvertently fell for a scam. Big Ideas in a Small Space from Real Simple February 2014: Designer, Michael Garvey, showcases a list of 10 easy DIY solutions from to make the most of a small space. Not only are his ideas clever, but they are also very simple to do. 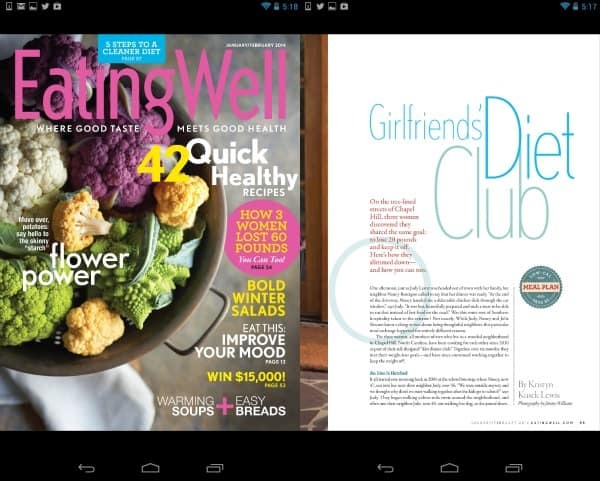 Girlfriends’ Diet Club from Eating Well February 2014: Three woman worked together to lose weight (60 lbs) and gain a lifelong friendship. Learn the logistics of how they cooked meals for each other, kept motivated and accountable and tips on how you can start your own diet club. 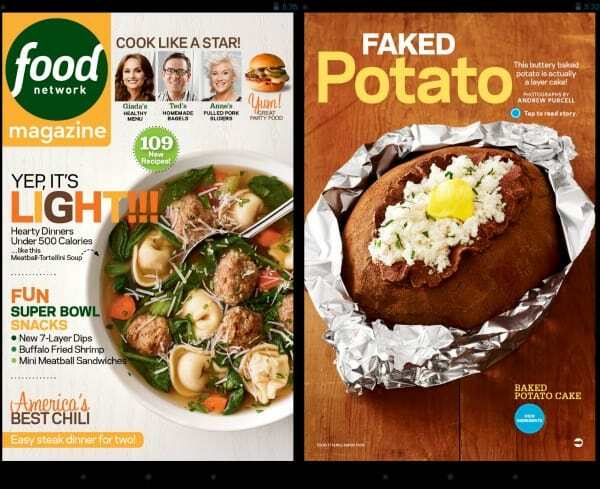 Faked Potato from Food Network Magazine February 2014: Is it a potato? At first glance I thought, yes. But nope, it’s actually a layer cake. See the simple step-by-step directions with pictures on how to create this deceiving dessert at home. Next Issue Canada has two monthly plans: Unlimited Basic and Unlimited Premium. Unlimited Basic is $9.99/month and gives you unlimited access to over 100 magazines. Unlimited Premium is $14.99/month and gives you unlimited access to over 115 magazines including the popular weeklies like Macleans, Time, Sports Illustrated, and more. Good news: you can try it before you buy it! Sign up for the 30 day free trial and test-drive the app to see how you like it. I’m doing the 30 day free trial right now and I’ll most likely be keeping it. You can cancel at anytime and there’s no commitment. If you enjoy reading magazines, give Next Issue Canada a try. Either way you’ll get to try it out for free for a month and maybe you’ll decide that it’s something you really enjoy having. Connect with Next Issue Canada on Facebook, Twitter and Pinterest. I need this in my life! Love the idea and how many magazines you have access to. Thats a great resource, I will look at the US version. I downloaded the app after you told me about it, love! I’ll be taking my iPad with me more, this’ll come in handy when at all the kids activities during the week! Love this, I am such a magazine junkie! If I had an e-reader of some sort I’d definitely opt to get my magazines this way. Very neat. I hate clutter and I tend to have a lot of magazines around and in my closet. Thanks for sharing this. Tablets really are the way of the future!! This is a great idea and so much better for the environment too! I have Next Issue and love it!! My husband & I share the subscription as you can have one account on multiple devices-it saves us so much money and we are both reading more! This is really cool, I find magazines to be expensive these days. The price of this app is affordable for everyone and you get a great selections.. This sounds great! I am going to download the app and try out the free trial! This is a great site as there are so many magazines to choose from! So going to sign up and try it out. Thank you! I think all magazines should go digital so they will stop using so much wood to make paper and such. Most people don’t keep magazines long anyway. This is a great new service! I love magazines and this is such a great way to always have one with you to read! Wow, this looks like a great program, is it only available in Canada?